COSTAR Version 4.7.2.300 Breaking News – New Product Announcement! COSTAR Mobile for IOS (Apple) and Android (Samsung) devices! COSTAR Computer Systems is pleased to announce the launch of COSTAR Mobile, Digital Vehicle Inspection system, fully integrated with COSTAR’s shop management software for single and multi-location tire and auto service dealers. View your work orders, take pictures, scan VIN’s, complete vehicle inspections and more. All from the COSTAR Mobile app which is tightly integrated with your existing COSTAR Shop Management System. The COSTAR Mobile app is an add-on product, developed by COSTAR, to extend the functionality of your COSTAR Shop Management Software. COSTAR Mobile allows technicians to perform a full vehicle inspection using a tablet or phone instead of paper, while recording the issue severity using pictures and voice to text notes. All technician collected information is immediately available from the COSTAR Repair Order at the Service Counter. No more running back and forth between Service Advisor and Tech! Service Advisors can then send the results immediately to customers via email or SMS text message. Sharing the complete estimate including digital inspections with photos, builds trust between customers and the service center. Service Advisors also have an easier time selling work when customers can see what the technicians see. Repair shops using COSTAR Mobile should see industry gains in their average repair orders from 15 to 30 percent. This translates into significant sales increases every month! 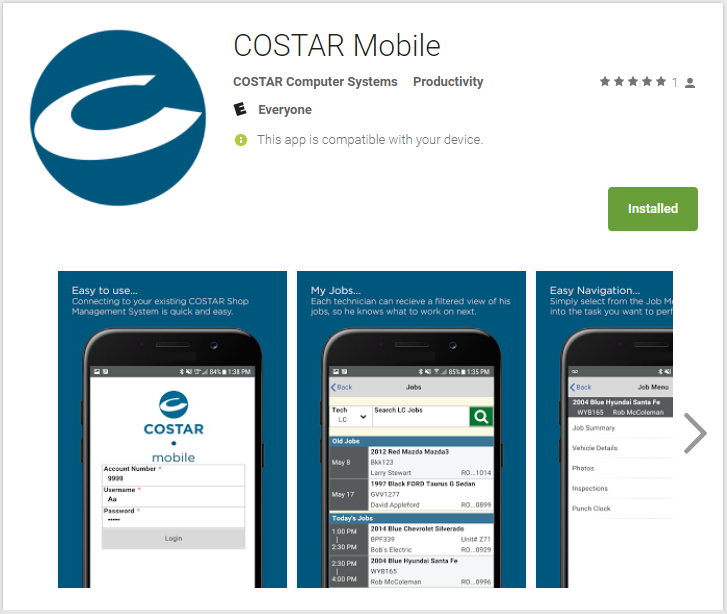 The COSTAR Mobile App is available for download from both the Apple App Store for IOS and the Google Play Store for Android making it is easy to download and install on either shop owned tablets or employee’s own smart phones or both. For more information and pricing contact COSTAR at: 1-800-661-7126 or email sales@costar.ca.